A high quality and great value car and vehicle shampoo concentrate. You only need 2 capfulls in a bucket of water, so this 1 litre bottle will make around 1000 litre of wash solution - around 25 washes. 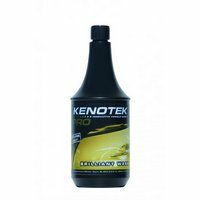 Kenotek Brilliant Wash has gloss enhancers for a great shine and is also self drying, which saves time on your weekly wash. It has a refreshing grapefuit aroma and is soft and safe on hands and all paintwork types, modern or classic. Directions: Soft for hands, nice grapefruit fragance.